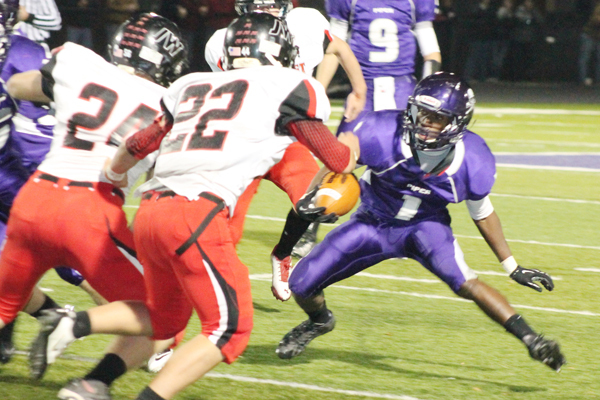 Last season’s Kansas Class 4A Bi-District game for Piper’s Matt McDonald was one to forget. Sure, the Pirates walked off the field winners against Perry-Lecompton and he even contributed, but a season-ending ACL injury during the game rendered McDonald helpless as he watched his teammates lose in the next round to Blue Valley Southwest. Well, McDonald made it all the way through Tuesday night’s Bi-District game against Jefferson West but the Tigers probably wish he hadn’t, as he ran for 150-plus yards and four touchdowns in a 34-21 Pirate win. “I didn’t finish this game last year, so this means a lot to me,” McDonald said after his second-ever four-score game. McDonald combined his speed and elusiveness with a strong offensive line to score on runs of 19, 35, 17 and 6 yards. While Piper walked away with a two-score win, the Tigers gave them all they could handle from the get-go. Jefferson West used a 12-play, 90-yard drive capped by a 3-yard touchdown run from quarterback Ian Mullins on fourth down right before halftime to knot the score at 14-all. But Piper needed less than a minute into the second half to set the tone for the final 24 minutes of the game. It started with a 45-yard kickoff return on a squib kick by pint-sized junior Dion Saunders – all 5-foot-7, 148 pounds of him. McDonald did the rest, scampering 12 yards and then 17 into the end zone to give Piper the lead for good. That momentum carried over to the defense, which was dominant in the third quarter. The defensive unit allowed only 10 yards of offense to the Tigers on three possessions and didn’t give up a first down, while also forcing an interception, a turnover on downs and a punt. McDonald’s fourth score put the Pirates up 27-14 before the Tigers made one final push in the final quarter. A 10-yard touchdown run by Wyatt Miller made it 27-21 with 5:14 to play. After a pair of first downs, Piper was facing a fourth-and-16 on the Tigers’ 34-yard line. Brindle opted not to punt, instead running a trap play for Paul Jones who got the first down and then broke a couple of tackles for the score, sealing the win. The win sets up a regional matchup with a 7-3 Baldwin team Saturday. Piper will host the game and is looking to erase the memory of last season’s 41-14 defeat. A win would put the Pirates in the Class 4A quarterfinals, a spot no team in school history has reached.